Trees don't need a lot of pruning on a regular basis. If necessary, remove dead, diseased and conflicting limbs. Remove limbs that interfere with cars or pedestrians. Remove limbs that have grown to cause the tree a one-sided unbalanced effect that might lead to wind damage in the future, etc. Basically tree pruning is for your benefit, not the tree's. Don't artificially "lift" trees and do not "guy" trees. 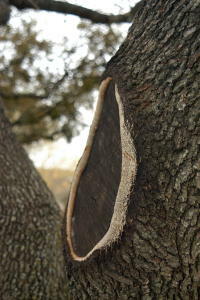 Some species of trees can be severely damaged by removing too many lower limbs. Don't make flush cuts and don't paint cuts in most cases. Pruning paint slows the natural healing process and harbors pathogens. If you must paint cuts to be able to sleep nights, use natural shellac or better still, the imported product called Lac Balsam. 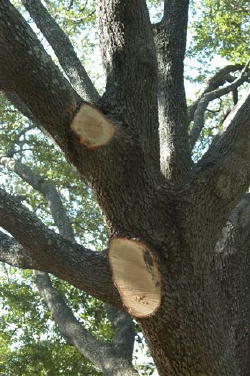 Proper cut preserving the branch collar below on the left, improper and harmful flush cut on the right. 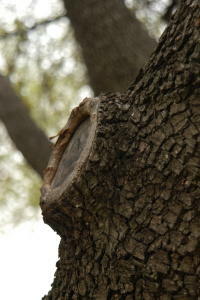 Grossly improper pruning below showing flush oval cuts that have removed the branch collars. These kinds of cuts encourage decay above and below the wound and usually lead to cavities long term.